Let's face it parents, we grew up in a different time. As kids, nothing was handed to us. We either worked or helped to earn our rewards: money, an activity with friends, or something we wanted. Scouting still believes in and stands for the core value of earning! We plan to make this our MAIN fundraiser for the year - so we need everyone to participate! Selling snack sticks makes Scouting a great experience for our sons, siblings and parents. This allows us to purchase awards and recognition's, keep our website and tracking software running, pay for office expenses, supplies, and everything our Pack needs to run a well rounded program. Let's do a good job and get it done! 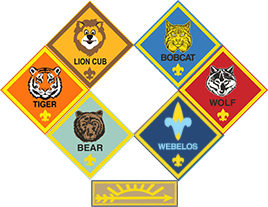 Scouts will receive order forms from their den leader or at their first den meeting. Every scout is expected to participate in snack stick selling. If each scout can sell one box ($154), it will help maintain our budget levels. BE SURE to get customer email addresses to send them a "Thank You" email after the sale. The Scout with his Akela goes door to door with a box of snack sticks. The customer selects his/her snack sticks and the Scout collects the money. Parents/Guardian can take an box to their work. Fellow co-workers select their snack sticks. Parent/Guardian delivers product and collect the money. Site Sales make up a big part of our snack stick program. We've obtained permission from local businesses to set up a sales table. Site Sales have plenty of products on-hand for people to buy. Different Scouts work at the table in shifts. Always have adult supervision. Check the calendar for site sale times and other important details. All Checks made out to "Pack 719"
Pick your flavors and place your order today! Money is due by October 22nd pack meeting. Saturday, October 13th from 7am - 5pm at Ace Hardware in Westminster. Sunday, October 14th from 10am - 4pm at Ace Hardware in Westminster.